Why is 3D printing such a powerful way to make solid objects? Journalists often ask me what is special about 3D printing. So I answer them. And then they don't print what I say. The reason is that they are frightened by mathematics, or that they think that their readers are. Often things just get more complicated the more of them there are. If you are a bank with a million customers who have account numbers and your computer has to sort them into order, then that is a more complicated problem than it would be if you only had a thousand customers. But shapes aren't just complicated like that. They can be complicated in two other ways as well. And third there is “dimensional” complexity – a triangle is two-dimensional, but a pyramid is three-dimensional. These three complexities are independent. You can have any mix of them. If you have a piece of string, you can tangle it in 3D (as any kitten will be able to demonstrate); but a piece of string in 2D is simpler, and so cannot be tangled. Bearing this in mind, lets look at the difficulty of getting a computer to control machines to make something automatically in two ways: by cutting the thing from a solid block, and by 3D printing the thing layer by layer. Here is a turbocharger from a car engine. And the object top left with the yellow tip is a cutting tool that is removing material from a solid block to reveal the turbocharger like a sculptor chiselling a block of marble. 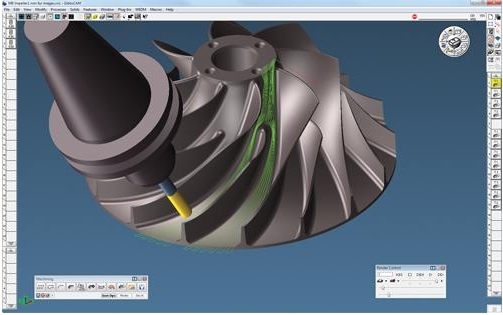 To make the turbocharger the computer has to figure out how to move the yellow cutter. Rather surprisingly (as we live in a 3D world) the cutter can move in five dimensions. These are the normal three: left-right, front-back, and up-down, plus rotations about those directions. The rotations are needed because the cutter must twist to cut the shape. That totals six dimensions, but rotation about the axis of the cutter itself doesn't count, which leaves five dimensions. The computer controlling the cutter needs to work out how to move it around in that five-dimensional space. And not only that, it has to make sure that no part of the cutter (like the conical bit at the top where it attaches to the cutting machine) collides with any un-cut part of the raw block, or with the turbocharger being made. This is a very very difficult mathematical and computational problem, and we still (2013) can only solve it for some shapes, even though we know the computer should theoretically be able to be cut out others that we can't (at the moment) solve. Now let's look at the turbocharger being made on a 3D printer. This will start at the bottom and build the first layer of the turbocharger. Then it will move up a fraction and build the next layer. And so on. The right hand picture shows a layer about half way up, and this is all that the computer has to deal with at each stage – a 2D problem, not a 5D one. It is very easy to program a computer to deal with such 2D shapes, and – for this reason – 3D printing machines can make any shape that the physics of the machine can handle, no matter how complicated that shape is. And, unlike with cutting, there is no problem of collisions. The computer always knows that it can move the 3D printer freely above the layer being printed, because there is nothing there yet. 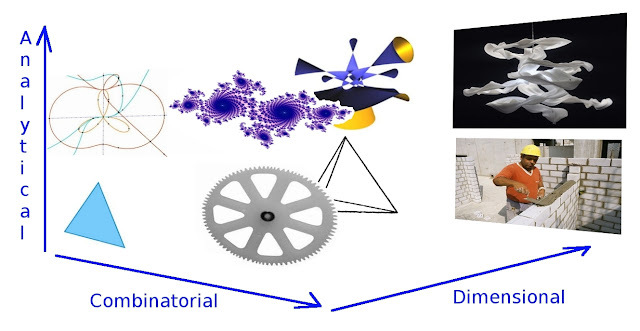 This simplicity of the computing and mathematics of 3D printing is the reason that it is humanity's most powerful manufacturing technology: the computer controlling a 3D printer will always have a much easier problem to solve than a computer cutting out the object being made, no matter how complicated the object is. And because of that, 3D printing is by far the most versatile way we have to make things.